Team Bonding was established in Sydney in 2007 and we’ve grown every year since, managing over 300 events a year for the “who’s who” of Australian business in Sydney, Melbourne and Brisbane. Founder, Cate Richards believes that to balance the pace of corporate life today it is vital to pause once in a while to reward all that effort and celebrate achievements with some good old-fashioned fun and laughter. The most successful teams have a common purpose, consistently excellent delivery, strong communication skills and a degree of mutual respect. There is an X factor that elevates a good team culture to a great team culture – we believe that X factor is developed by mindful nurturing of team spirit and interpersonal relationships. All teams with stand out cultures we’ve met in the last 11 years have strong bonds and great rapport. 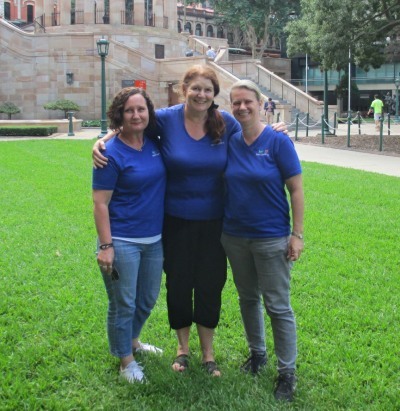 We have a fantastic team on the ground in Brisbane, trained by Cate Richards and led by Anna Davidson and Selyna Bradford who are photographed here with Cate in Anzac Square. Team Bonding was established in Sydney in 2006 and grew fast. In 2014 we ran creative, fun and memorable teambuilding events for over 300 blue chip client teams, and are on track to run 400 events in 2015. The founder, Cate Richards, believes that with the pace of corporate life today, it is vital to pause occasionally to celebrate achievements with some old-fashioned fun. There is mounting evidence to suggest that the most successful teams have; a common purpose, consistently excellent delivery, strong communication skills and mutual respect. High performing teams all seem to have strong interpersonal bonds and really enjoy their time together. Smart managers know that their team members are happier and more productive working with people they know and respect. Studies show that people stay in jobs longer because of friendship. Our results and testimonials show that there’s no better way to build rapport and positively influence team spirit than to dedicate time to togetherness outside of the structures of the work environment.